This 5-minute mindfulness practice cultivates gratitude for life's small delights as you move through the senses. Waking up this morning, I glanced at my cell phone and noticed the weather app ominously predicting many days of snow and icy temperatures ahead. Brrr! I could feel the chill of dark thoughts starting to gather. I could feel my body creak with cold and aging. Life’s challenges were seemingly everywhere. And yet…I was smiling. I was cheerful. I was grateful. What? Was I crazy? I made a general goal to cultivate more resilience around the ups and downs of life, so I made a point of tuning my awareness toward the appreciation of life’s small delights. I was curious about what I would discover if I focused intentionally on the things that I appreciated. This morning, as I let wakefulness peel the dark back, I could smell my neighbor’s coffee brewing. The snow outside gently buffered the sounds of the world. I could sense my husband’s warm weight in the bed. I took a long moment to enjoy the muted winter light edging in around the slats of the window blinds. There was nothing particularly special going on, but I noticed that being grateful for little things was already lifting my dark thoughts. Difficulties were still present, but awareness of my gratitude was shifting my view, letting me see that everything was not dark and cold—in fact, many sights and sounds were quite lovely. There was nothing particularly special going on, but I noticed that being grateful for little things was already lifting my dark thoughts. Would you like to join me in cultivating a bit of gratitude together? Close with gratitude. I’m so grateful that you tuned in to this gratitude practice, and I appreciate your time, your effort, and your energy to be present, awake, and alive to your precious life. Have a beautiful day. This mindfulness practice provides additional information to an article titled, “Thanks for This,” which appeared in the April 2018 issue of Mindful magazine. 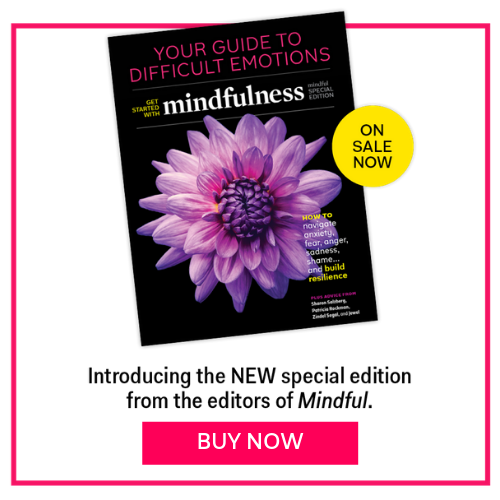 Subscribe to the digital issue of Mindful to get immediate access to the April issue.